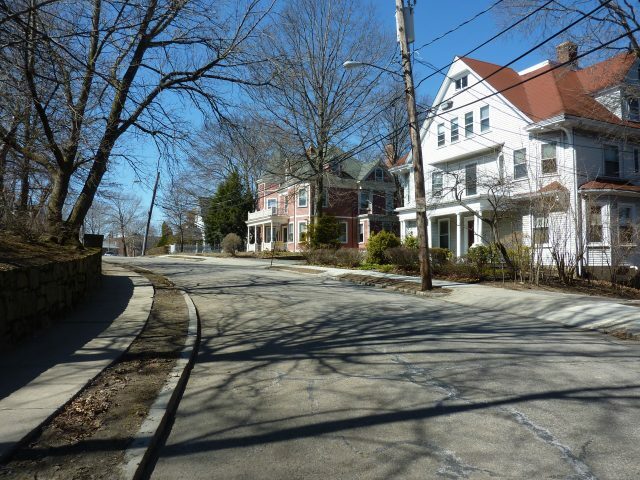 Aspinwall Hill is situated between the Corey Hill and Fisher Hill neighborhoods of Brookline and has a rich history, dating back to 1788 when Dr. William Aspinwall purchased the land that would later become known as Aspinwall Hill. Today, Aspinwall Hill offers both single-family homes and multi-unit homes, including the Beaconsfield Terraces that were built in the 1880s and 1890s and are often referred to as “castle buildings” because of their stained glass windows, rounded turrets, and stonework. Many of the houses that were built during the initial growth of Aspinwall Hill have now been turned into multi-unit dwellings that offer both the convenience of apartment-style living and the architecture of classic Victorian homes. Though housing density is relatively high in Aspinwall Hill the neighborhood does not feel cramped, as the streets are very quiet and offer plenty of greenery and shade. Aspinwall Hill is conveniently located a short walk from the Washington Square and Beaconsfield T stops on the MBTA green line. Residents of the area enjoy the quiet privacy of the neighborhood as well as the close proximity to the shopping on Beacon Street. This pedestrian-friendly neighborhood also features one of Brookline’s most popular parks, Schick Park, located at the top of the hill.